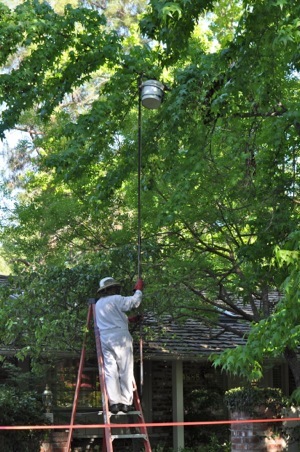 The honey bees descended on the front yard of Mary and Rich Rollins’ west Menlo Park home around 10:00 am on Memorial Day. Or is it “ascended,” being as the swarm took roost at the top of a tree? Whatever, the bee invasion was not welcome. But who to call, given that it was a holiday? We encountered Mr. Bee when he was about halfway through rounding up the swarm. He’d gotten half the bees in the first attempt and was working to get the second half late Monday afternoon, placing them in a wooden hive that was put back in the tree to attract any stragglers. The hive will be removed on Thursday. I too saw this sight as I embarked on my run. Good to see we can count on Mr. Bee!